Is the United States military prepared for war? The United States is not prepared for war against either Russia or China. This is according to Senator Jon Kyl. The senator opined that the military superiority of the United States is not where it once was and this has left the existing troops unprepared for international threats. The United States defense has never been as fragile as it is at the moment. This puts the American citizens and the American economy at risk and has greatly reduced its global influence. Rival states are challenging America’s position as a global superpower questioning the states ability to defend its interests as well as that of its allies and partners. President Donald Trump has not been doing much to aid the situation. If anything, he continues to send mixed signals in matters state security. In August 2018, the President signed into law a national defense spending plan that would see American troops receive a 2.6 percent pay raise. The spending plan also included provisions for other purchases such as F-35 Joint Strike Fighters. Later in October, President Trump proposed the defense budget cuts in a cabinet meeting. Unlike the U.S., rival countries such as Russian and China are investing heavily in National defense. This gives them a defensive edge when it comes to dealing with International threats. It is not clear as to why the President proposed budget cuts in National defense even in the face of increasing international threats from better prepared rivals. According to the report by Senator Kyl, China and Russia were singled out as possible threats. The report also noted that the focus on counter terrorism did not give the nation a competitive edge in areas such as cyber operations, missile defense and anti-submarine warfare. The senator’s report rightly concluded that there is a need for investment in National defense. America cannot afford to take risks with its defense especially not in the wake of increasing international threats. Life doesn’t always goes as planned. Imagine being a young mother to two children and losing your husband. As painful as that reality is, Dr. Naira Velumyan lived this ordeal. Living in her homeland of Russia at the time, Dr. Velumyan had to turn her life around, focusing on creating a brand for herself and investing in opportunities for the survival of herself and her children. After obtaining her master’s and doctorate in psychology, Velumyan decided to pursue something that has always fascinated her; Jungian analysis and symbolism in art. 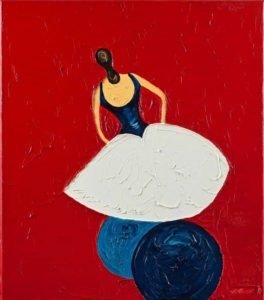 Coming from a background in law and psychology, this was not an easy jump, but Velumyan embraced the connection between an artist and his audience through the collection of images. Jungian analysis deals with the psychology of the unconscious and a persons’s attitudes of the ego. Using this relation to artwork connects our unconscious mind to an artist’s intensions through his work. While trying to put her life together, a close friend introduced her to a Russian artist named Alexey Klokov. Klokov was able to give Velumyan an inside perspective on the life of an artist growing up in Russia. She became inspired and Velumyan used her understanding of art to become a gallerist and Mr Klokov’s agent. She was now part of an exclusive artistic world — little did she know she would be thanking her future husband at the time. Velumyan spent her time in Russia building up a solid business network and becoming a certified art dealer, exclusive to Klolov’s work. To grow in business you always have to think outside of the box and this is why Velumyan had thoughts of integrating her Russian art brand into the North American market. Prior to this, she had little exposure to the North American art scene and all her connections were in Russia. She managed to maintain a private psychological practice and balanced her time. Despite this, Velumyan pushed through and left Russia for Canada in the pursuit of building an even bigger and noticeable brand for her husband’s artwork. She was now classed as an immigrant in unfamiliar territory and with it came all the challenges. She was unestablished in a country full of competing artists striving to make a name for themselves. During her first year in Canada, she had to learn English while having her Phd credentials approved. Velumyan attended the Bridge Training Program for Internationally Trained Mental Health Professionals, interned at a local clinic, and subsequently received her license in psychotherapy. Velumyan was used to helping people, so in addition to her art work, she became a founding member of an organization called IWB. IWB stands for Immigrant Women in Business and is an organization dedicated to Helping Immigrant Women in Business to Succeed. It is run by CEO Svetlana Ratnikova, a fellow Russian immigrant in Toronto. As a founding member of IWB, Velumyan publicly shares her struggles as an immigrant and how she excelled in life. 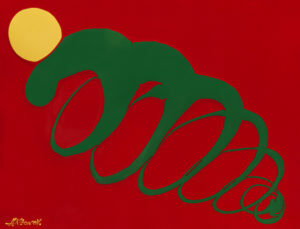 For International Women’s Day in March, Velumyan spoke at an IWB event and featured the painting shown above, ‘Potentiality’ which she says Klokov created to show the path of an immigrant ( the green mark) rising to success (yellow). Her talks offer a form of mentorship for immigrant women thinking about venturing into business. As Alexey Klokov’s exclusive agent, Naira represents the sole interests of his work. She is developing a Canadian brand, organizing exhibitions, providing all printed products, and conducting negotiations with dealers and buyers. Currently, she hosts private art exhibits in Toronto, Ottawa, New York and Miami and is looking to establish a gallery network in these cities. Success in the art world was not linear for Velumyan and she knows the struggles women face in life. For a chance to listen to one of Dr. Velumyan’s talks, check out the next IWB event, scheduled for September 5 at Metro Hall, downtown Toronto. The event will run from 6-9pm and will offer various inspirational speeches and networking opportunities from other successful founding members. For more information and to register check out their Evenbrite page.